In this post I am going to tell you about the best available online coaching options for students of Class 6th to Class 12th. Normally for core subjects such as Math, Science, English and Social Studies of these classes, parents go for personal tuitions. Option of coaching institutes is also available and big player such as FIIT JEE, Aakash Institute, Allen, Catalyser etc. have also entered in this field. Earlier these institutes were exclusively for preparation of IIT JEE and other Engineering and Medical Examinations however sensing the big market they have now also started coaching for the students of 6th standard onwards. Now they provide coaching covering school syllabus of various boards such as CBSE, ICSE etc and they also provide foundation course for IITJEE in which they teach a higher level of math and science in junior classes. The difficulty parents face that in personal tuitions it is always difficult to find good teachers in vicinity and the reputed coachings are expensive and child also get overburdened. There are other local coaching options available as well in every city but problem is that there infrastructure is not that good and the quality of education and teachers is also not up to the mark. So what should parents do? How they can make a balance so that they can provide best quality education to their kids without overburdening them. This problem can now easily be solved through Online Coaching options. The purpose of this article is to guide you about the best available Online Coaching options. Before telling you some of the best options I would like to tell you the benefits of it. The benefits of Online Coaching are many. The most important one is flexibility of timings, in normal coaching you need to send your child at a fixed time and there is no such flexibility. Lot of time also get wasted in commuting. Students also feel overburdened as after attending the school they have to go to coachings. However in Online Coaching there is no such issue, the child can study anytime as per his or her will. Also the studies in Online Coaching are much focused and time is not wasted at all. Further, through video lessons or online class you can learn the topic many times as you can always repeat (online classes also get saved in your system) it if you have not understood anything. The other benefit which I felt is that the quality of teachers is very good in Online Coaching, these coaching hires some of the best teachers of the country hence quality of the education is very good. Another benefit which I would like to mention is that through online coaching the progress of the child can also be easily monitored as there are various techniques and apps through which the progress can easily monitored. Now let us discuss some of the best available options one by one. 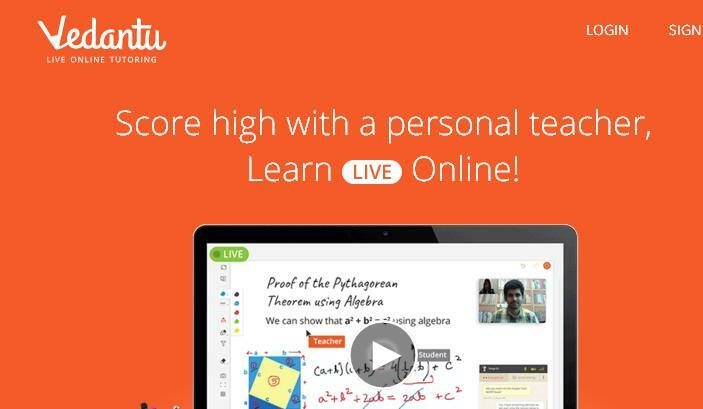 BYJU’S learning methods have become quite popular in last few years. It provides coaching for all the class from 4th to 12th. It also provides coaching for various boards and various competitive examinations. The study is done through a Tablet or android device. The BYJU’S will provide you the course material in the form of memory cards and will also provide you a Tablet. One can study from the Tablet itself. This Rs. 3300 crores company was started a few years back with an initial investment of Rs. 2 lacs only. The idea was initiated by Byju Raveendran who is a CAT Topper with 100 percentile. The benefits of BYJU’S study material are that the quality of the study material is very good and one can study any time as per his or her convenience. BYJU’S hires some of the best teachers for preparation of its study material which they impart through Tablet. Toppr.com is another start-up which is now picking up and giving tough time to BYJU’S. 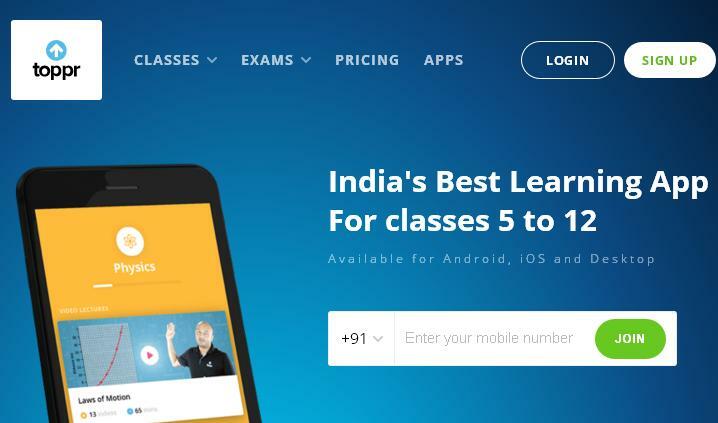 They are also providing all the stuff very much similar to that of BYJU’S however the difference is that while BYJU’S is giving Tablets for study, Toppr.com is an online platform and can be accessed through web only. The price of the course in Toppr.com is also very much similar to that of BYJU’S. The idea of Toppr.com was initiated by Zishaan Hayath and Hemanth Goteti, both alumni of IIT Mumbai. Toppr.com has become a multi crores company as they got venture funds of Rs. 70.00 crores from various venture capital firms. Toppr.com provides students very good quality study material and best thing here is that they also clear all the doubts of students on a real time basis. The quality of material is as good as that of BYJU’S and personally I will rate Toppr.com above BYJU’S. It is another good option for the students looking for online coaching. The level of questions and study material is slightly less that the first two options which I discussed above. But still up to 10th classes it is a very good option for self preparation through online mode for the students. Topperslearning.com has been promoted by promoters of Network 18 and Educomp. The online platform is very good and of high quality. The last option which I am going to discuss in this article is vedantu.com. This is also a venture of IITians. The concept here is different from the first three which I discussed above. Here you are directly getting online tuitions from some of the best teachers, through online mode. I had tried it for my son and found it very useful as quality of teachers here is very high. You can get tuitions from some of the best teachers through online mode. The platform which they have established on their website for online tuition is also very effective. Conclusion: So these were the 4 online coaching options which I wanted to share with all of you. There are many more available but in the paid options these are probably the best available options. I also told you in brief about the promoters who have initiated these ventures. You can see that 2 of these ventures were started by IITians and 1 by a CAT topper. These concepts have become so popular only because the quality of education is very good and also the pricing is affordable. My suggestion is that you should definitely try any of these options for students up to class 10th. Thereafter for class 11th and 12th one should go for classroom options such as of FIITJEE, ALLEN, AKASH, CATALYZER etc. as well as for anyone of the online options i.e. BYJU’S or Toppr.com. If you are going for any online coaching option always negotiate as much as you can in price. The market has become very competitive in Online Coaching and discount of 30 to 40% is quite common on the given price of any course. My suggestion is do not overburdened your child at an early age. Up to 10th class provide him or her the best support for doing well in School Exams. Exams such as Olympiads, NSTSE, NTSE etc. are also good as these are based on the school syllabus itself. These online tools can help the child in clearing concepts which will provide a good base for the future challenges of tougher Exams. Copyright © 2019 by GuruBlog.in. Theme: DW Focus by DesignWall.